Protesters outside the National Press Club in Islamabad, the capital of Pakistan. Image by Annam Lodhi. Used with permission. “Naqeeb Teray Khoon Se, Inqilab Aye Ga,” (Naqeeb from your blood we will bring about a revolution) chants a crowd outside the National Press Club in Islamabad, the capital of Pakistan. 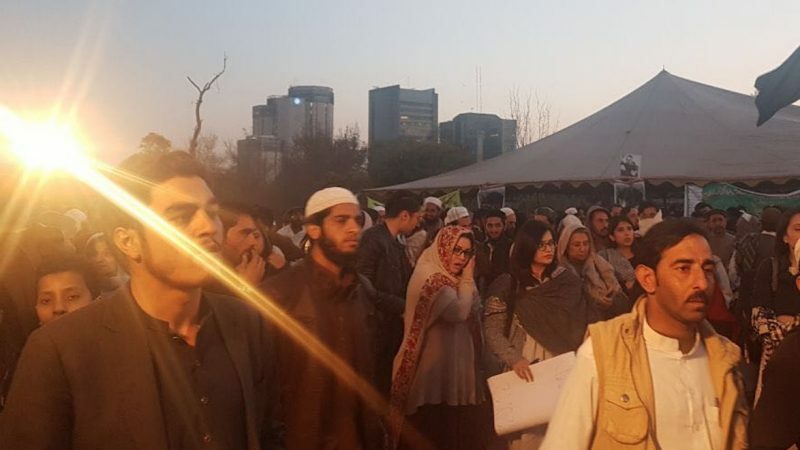 Thousands of ethnic Pashtuns from the Federally Administered Tribal Areas (FATA) and elsewhere in Pakistan have staged a sit-in in front of the National Press Club in Islamabad for the past week. 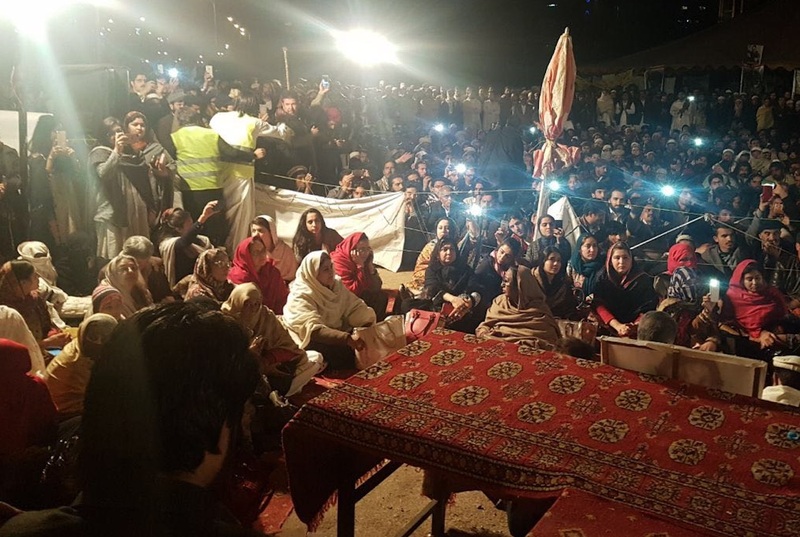 The protests were initially sparked by the extra-judicial killing of Pashtun shopkeeper Naqeebullah Mehsud, but have now become a rallying point to speak up about issues affecting the Pashtun community. The Pashtuns (or Pathans) are an ethnic group who mostly live in Pakistan and Afghanistan. They speak the Pashto language and various other dialects; they also have a rich traditional set of ethics and a distinctive culture which guides individual and communal conduct. In Pakistan, there are currently about 30 million Pashtuns (15% of Pakistan’s total population) and in Afghanistan, they are the largest ethnic group and make up between 42–60% of the 32.5 million population. 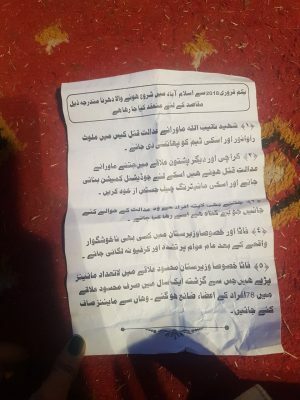 Why are the Pashtuns protesting? Many Pashtuns are disadvantaged in Pakistan. Pashtun refugees that have crossed into Pakistan from Afghanistan mostly live in squalid refugee camps in poverty. Also, many local Pashtuns from the Afghan border area — the federally administered tribal area (FATA)– are internally displaced in their own country due to military operations related to the War in Waziristan and also live in camps. They have endured years of terrorist violence and military operations where hundreds of thousands of families lost their businesses and livelihoods. Protests have been raging on since Naqeebullah Mehsud, a 27-year-old Pashtun shopkeeper from FATA, was killed in an alleged staged extrajudicial killing in January in Karachi. The phenomena of extrajudicial killings and fake encounter killings (when locals are murdered and shown as culprits for the good of the security agencies) are not new to Karachi. In 2017, 65 extrajudicial killings were suspected and 20 were investigated; in six cases, police officers were found to be involved in misusing their powers. What is different about Naqeeb’s staged killing is that it has triggered a movement led by the Pashtun youth who feel that they have long been at the receiving end of punishments and are subjected to ethnic stereotyping and abductions by security forces. A judicial commission should be made for the extrajudicial killing of the Pashtuns and the Chief Justice of Pakistan should directly monitor it. Global Voices (GV) was present at the protest in Islamabad and talked to some of the protesters. On 8 February, Haider and many other students were at the protest for more than a week and said that they are sacrificing their education and earnings in the hope for change. 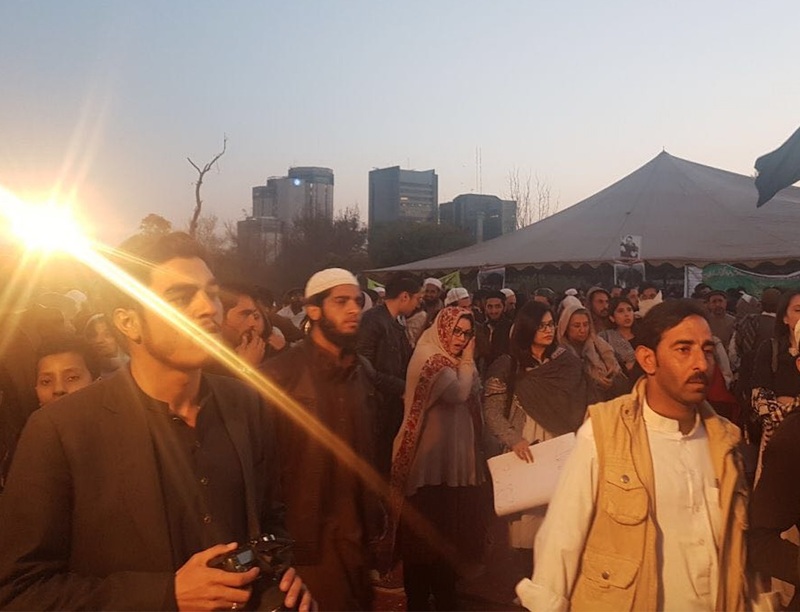 The ongoing sit-in was organized by a social media group of young Pashtuns, with the hashtag #PashtunLongMarch. The demonstration is currently being attended by 50+ women and about 2000 Pashtuns from the tribal areas and other parts of the country every day. The protest was widely ignored by national media until social media and international outlets reported on it. The Human Rights Commission of Pakistan called upon the Government of Pakistan to take notice of this protest and to listen to the demands. 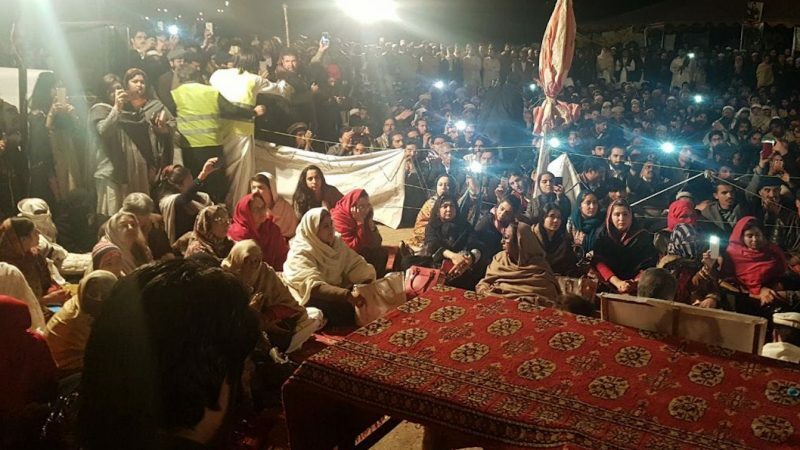 Pakistan’s Prime Minister Shahid Khaqan Abbasi assured the protestors that Naqeebullah Mehsud’s killers will be brought to justice. The government hasn’t given the protest it’s due attention. He (the Prime Minister of Pakistan) should have announced what the government plans to do and what are the steps the government will take. The media was controlled and not allowed to cover the protest. The protest was huge on the first few days. Whenever a terrorist incident happens the whole community is punished. The Watan card should be done away with; if its good for them (the Pashtuns) it should be good for the PM of Pakistan also. Social Activist Gulalai Ismail addressed the crowd on the eighth day and said, “Punjab main Orange Line or KP main land mines,” (The Punjab province has the orange line [train] while KP [Khyber Pakhtunkhwa] has landmines) pointing toward the lack of development in the province. She further added that the lives of Pashtuns seem cheap because the government ignores the atrocities against them every day. Women participating at the protest. Image by Annam Lodhi. Used with permission. Women today also sent a strong message that we in our bangles are as strong as men with their weapons — with the power of nonviolence they vowed to take the revolution forward. Pashtun women have suffered a lot; the ongoing conflict has strengthened the patriarchy. In the name of tribalization/FCR women have been deprived of their human rights. Moreover, leaders of the parties from Khyber Pakhtunkhwa like the Awami National Party (ANP), Pakhtunkhwa Milli Awami Party (PMAP), Jamiat Ulema-e-Islam and Qaumi Watan Party participated in the Pashtun Long March and addressed the protesters, showing their full support for the protest. Protesters have long felt that the current administration has been ignoring the basic rights of the Pashtuns, delaying the FATA reform bill since the beginning of their tenure in 2012. Finally, in January, the National Assembly (NA) did eventually pass the bill which was seen as a step toward some reform in the way of a merger of the tribal areas with Khyber Pakhtunkhwa. The Pashtun community has always felt marginalized, from jokes about their ethnicity to undermining their talent in many walks of life in Pakistan — they have found it hard to make their way in the society. This rally is one of a kind because this may be the first time that Pashtuns have come to the capital en masse. There are no blocked roads or ethnic profiling with Watan cards and the protesters are asking for nothing but justice. The rally isn’t religiously motivated but rather ethnicity motivated; they hope for a Pakistan that is more accommodating to all it’s people and doesn’t divide on basis of ethnicity. Next PostTHESE CURVY PAKISTANI BLOGGERS ARE BREAKING THE INTERNET! Hey, I’d like to know your country’s narrative on a certain matter!